A magical labyrinth of exquisite Mediterranean interiors, beautiful views and food to make one’s heart sing… I must be at The Giri Cafe. Tucked away within the cobbled main square of San Juan, you may just be forgiven for walking past it. After all, its exterior doesn’t hint at the stunning expanse that awaits inside. I’ve learnt that this seems to be a common theme in Ibizan dwellings- the phrase ‘don’t judge a book by its cover’ definitely rings true. As we step inside the cafe, a cheerful waiter’s face immediately pokes out from behind a wall in the adjoining room, directing us to sit wherever we like. I’d looked up The Giri Cafe online prior to our visit, and excitedly set off into the restaurant to find the real life version of the images I’d viewed on the website. The interior is split into three parts; the first room a low lit, cosy nook full of dark oak tables and low hanging beams; the second, a sleek adjoining bar lined by stone stacked walls and a plethora of liquors; the third, a wide open space lined by sun drenched floor to ceiling windows. Each room seems to omit its own style and character yet they converge together like a colourful mosaic. We follow the restaurant through into the outdoor seating area dotted with potted plants and low hanging trees through the archway and into the garden. I clock the four poster beds lining the righthand side of the garden and immediately feel as though I’ve stumbled into a space reserved only for celebrities and superstars. Beds- outside?! It’s a million miles away from my Scottish abode; so glamorous and serene at the same time- I can’t make sense of it. We bypass the beds in favour of the more food-friendly looking tables for two along the opposite side of the garden. And then I die of happiness. The end. …Kidding. The cheerful waiter re-emerges and presents us with blackboards presenting a handwritten specials menu and the superfood smoothies of the day, along with the lunch and wine menus. There are now so many menus that I can no longer see the table. Right… lots of options, then! We order two glasses of Spanish Tempranillo and some mineral water then sit back and take in the surroundings. I was wrong about the type of people I’d expect to be here. Beside us are a group of sportswear clad friends lounging and chatting relaxedly. Nothing diva like here, unless you count the miniature chihuahua in tow. Other guests include middle aged holiday-makers sharing a bottle of wine, and a family with young children running amok between the rows of herb garden and flower patches. Does this sound a bit cliche; like some modern-day fairytale? It kind of is. Our food arrives and we gluttonously dive in after a few obligatory photo’s have been taken. Ah, the life of a food blogger. Andrew seems confused at first; his bowl contains just three lone tomatoes and some edible flowers. The confusion is quickly resolved when the waitress proceeds to pour over the Salmorejo, a chilled tomato based gazpacho. Equal parts light, zingy and refreshing, it tastes fantastic paired with the accompanying pita bread. My bowl is full to the brim; a plentiful helping of mango, cucumber and seaweed salad with mixed leaves, roasted almonds and a sesame dressing. It’s one of the best salads I’ve eaten- super light and fresh thanks to the mango and cucumber, whilst the sesame dressing provides a sweet and smoky contrast. We order some poppadoms with hummus to share, which are both perfect. The poppadoms are light and crispy whilst the hummus is creamy and intense, finished with a splash of olive oil. Everything is so delicious- we figure it would be a waste not to share some dessert and proceed to do so, tactically forgetting about the gelato we gobbled up earlier in the day. What are holiday’s for? Unsurprisingly, the lime and avocado cheesecake with cherry compote and white chocolate shard is creamy, flavoursome, and just the right amount. We look at the plate containing not even one last crumb, and conclude that The Giri Cafe is a winner. 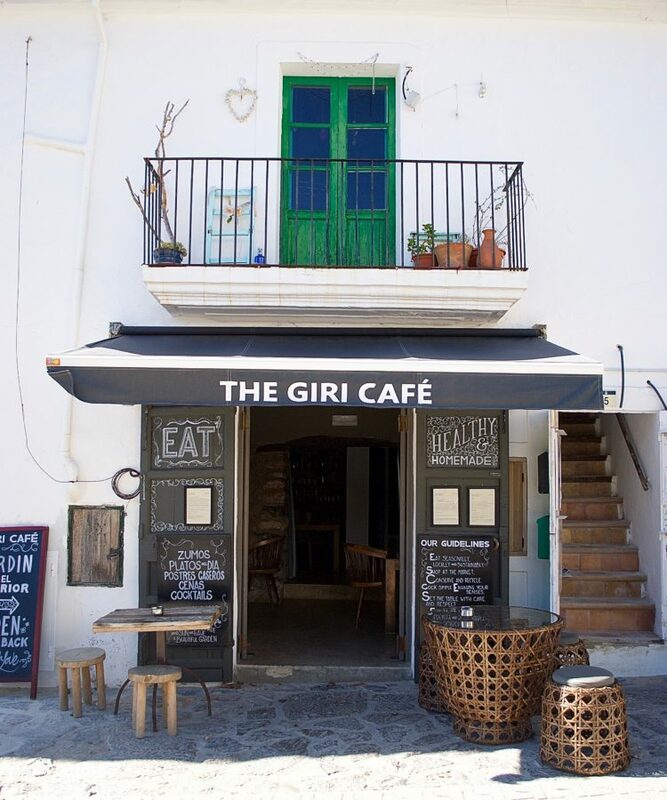 The Giri Cafe is a 20 minute drive from Ibiza Town and is open every day except Mondays. Breakfast is served from 10am, lunch from 1pm, and dinner from 8pm.